Parasitic Fish Lice, or Parasitic Isopod (Creniola laticauda), attached to a Leafy Seadragon (Phycodurus eques). Found throught southern Australia and often seen attached to fish. Photo taken at York Peninsula, South Australia. Leafy Seadragon (Phycodurus eques), with a Parasitic Fish Lice, or Parasitic Isopod (Creniola laticauda) attached. Found from Lancelin, WA, to Wilsons Promontory, Vic, but mostly in SA waters and southern WA waters. Photo: York Peninsula, South Australia. Parasitic Isopod (Anilocra sp.) - clinging to the face of an Ornate Cowfish (Aracana ornata). 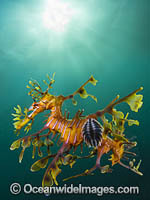 Photo taken beneath Port Hughes Jetty, Yorke Peninsula, South Australia. Gammaridean Amphipod (Cyproidea sp. ), resting on a tunicate. Komodo, Indonesia. Within the Coral Triangle. Gammaridean Amphipod (Cyproidea sp. ), resting on a sponge. Photo taken off Komodo, Indonesia. (This is a digital composite comprising of two or more images). Two Parasitic Fish Lice, or Parasitic Isopods on a Decorated Sand Goby (Istigobius decoratus). Photo taken in Malaysia. Parasitic Copepod attached just behind the pectoral fin of a Coral Goby (Bryaninops amplus). Bali, Indonesia.